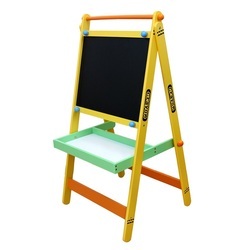 This playful crayon kids’ easel is a colourful addition to any playroom and is a fun way to get kids to draw and play! The easel is made of high-quality MDF and is robust and sturdy whilst remaining lightweight enough to be moved if required. Finished in a durable non-toxic coating, the crayon easel set is also entirely wipe-clean, so that getting the playroom spick and span is a breeze. Easy to dismantle - Perfect for Storage!